Lucy van Smit is an award-winning author, a screenwriter, and an artist who regrets selling off most of her paintings to pay the rent. (Jeremy Clarkson owns two) After boy trouble, Lucy dropped out of Art School for a year, ran away to New York and dared herself to sell encyclopaedias door-to-door in America. She got her BA Hons in Fine Art, blagged a job in TV, travelled worldwide for NBC News, flew on Air Force One with President Reagan, got surrounded by tanks at Manila airport during a coup, before she chilled and made documentaries for Canadian TV on writers like John Le Carre and Ian McEwan. Lucy is dyslexic with a Distinction in MA Creative Writing. 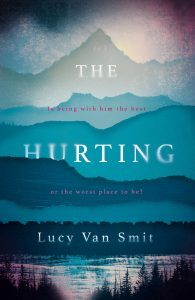 The Hurting won the inaugural Bath Children’s Novel Award. One of six siblings, Lucy lives in London with her hubby, teenage son and their mad cat, known locally as Sid Vicious.